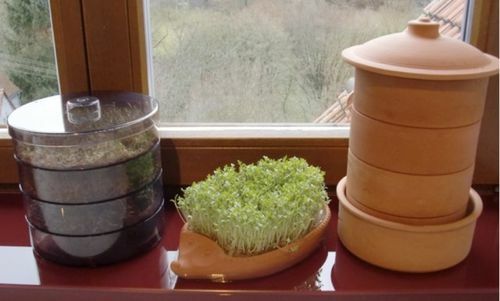 For the self-cultivation of sprouts, a simple clay saucer or sprout glass is suitable. More decorative is a sprout hedgehog, which for example the Company Römertopf offers. You don’t have to limit yourself to broccoli when cultivating sprouts, but rather use all members of crucifers. Warning: should sprouts spoil during growth in the clay container, wash the clay pot with a soft nylon brush and clean water and disinfect the container through heating in the oven for 45 minutes at 200°C.